We Demand an End to Assad’s Regime. We Demand Protection for Syrian People. We Demand Accountability. Born in the village of Namar in Daraa Province on February 2, 1962, Dr. Mohammad Al-Ammar is a practicing physician as well as a political activist. He has been arrested three times during the ongoing revolution and is currently held incommunicado. Mohammad Al-Ammar was arrested for the first time on 21 March 2011 on his way home from a meeting with the mayor to discuss the situation at the time in the city of Daraa. He did not come back from that meeting and was later found to be detained without charge at one of the security branches; he was released on 24 March 2011. Later, Dr. Al-Ammar wrote a proposal, addressed to the Syrian authorities, for solving the current crisis. In response to the proposal, on 3 May 2011, he was summoned to meet with General Assaf Shawkat, after which he was arrested by the Political Security Branch on the orders of General Dieb Zaytoneh. He was detained in Adra Prison, Damascus, until released on 5 June 2011 under the second general amnesty. On 17 September 2011 at approximately 6am, armed military security forces arrived at Mohammad’s residence in Namar village, Dara Province in a blue jeep and a bus. They stormed his home and the home of his neighbor, Samer Bakry, age 32. Samer, who was making ablutions at the time, was in his underclothes. They arrested Samer and his father, Muhammad Bakri (Abu Nazem), age 70. Also imprisoned in the same raid were Ibrahim Bakry (Abu Jafar), age 51; Osama Ibrahim Alammar (Tuqan), age 25; his maternal aunt’s son Omar Koshan (Abu Walid), age 60; and Omar’s son Belal, age 23. Mohammad and Samer are rumored to have been transferred to Military Security detention, Branch 291 in Damascus, in October. On 19 March 2012, Dr. Al-Ammar was again subjected to forced disappearance. 1. Join Mohammad’s support page on Facebook. Please use the below sample letter to demand the immediate and unconditional release of Mohammad Al-Ammar, as well as his neighbors. The mail should be addressed to the Syrian Embassy in Washington DC, with copies to international foreign ministries worldwide as well as media outlets. Addresses appear below the sample letter. I am writing to demand the immediate and unconditional release of physician and activist Mohammad Al-Ammar from detention in Syria’s security system. Mohammad Al-Ammar, age 49, was arrested for the third time by security forces on 17 September 2011 at his home in Deraa, along with his neighbor Samer Bakry, Muhammad Bakry, Ibrahim Bakry, Osama Ibrahim Al-Ammar, Omar Koshan, and Omar’s son Belal. These were arbitrary arrests and detentions. Arbitrary detention is illegal according to the International Covenant on Civil and Political Rights, Article 7. Syria signed this Covenant on 21 April, 1969. In addition, torture is illegal in Syria, both under international law as well as according to Article 28 (3) of the Syrian Constitution. The Penal Code of Syria stipulates punishment for anyone inflicting torture on a person. Syria’s security system is thus fully responsible for the safety, health and well-being of Mohammad Al-Ammar, Samer Bakry and all those arrested in that morning’s raid. I hold the Syrian government responsible for the safe return of Dr. Al-Ammar, Mr. Bakry, and for all prisoners of conscience and political prisoners currently held in Syria’s detention and prison system. All such detainees should be released immediately and without condition. 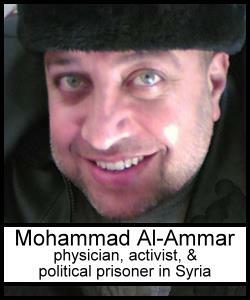 * Photo and biography of Mohammad Al-Ammar provided by Dr. Mohja Kahf. Sign the petition to demand an end to the Assad regime, protection for Syrian revolutionary people, and accountability of responsible international organizations.